Peckforton Castle is a stunning hotel which overlooks the glorious Cheshire countryside. Popular as a wedding venue, Peckforton Castle features two restaurants, a spa, conferencing facilities and a selection of adventure activities, including Land Rover experiences, falconry and archery. The castle dates back to the 1840s and is a Grade I listed building. Over the years it has been the backdrop to films such as Robin Hood and Sherlock Holmes, and featured in popular TV shows, most recently the Channel 4 soap Hollyoaks. Peckforton Castle leaves a strong impression on anyone who visits, such is its atmospheric splendour. Our brief was to create a website which conveyed this sense of history, occasion and grandeur, even before guests have stepped inside. Peckforton Castle already had a strong brand, stunning facilities and a reputation for excellent service. When we were invited to pitch for the website project, our creative team relished the challenge. During a number of creative meetings we developed the concept ‘Eat, Love, Sleep, Play’. These four emotive themes linked to the four services available at the castle – restaurants, weddings, hotel rooms and adventure activities, and formed the backbone of our marketing story. Creative imagery and strong branding was aligned with the Eat, Love, Sleep, Play theme to bring the idea to life. The home page was designed using a series of large-scale images with fairytale-inspired straplines to help people imagine the magic of Peckforton Castle. A black background throughout the site added to the sense of drama, while the overall tone of the design conveyed a sense of luxury and grandeur. An intuitive sitemap and user journey was devised to enable people to quickly and easily access the information they were looking for. The site was built using a customised content management system, enabling Peckforton Castle’s management team to maintain the content in-house. It features an online booking facility as well as 360° room views and a series of interactive brochures to help people plan their stay. Throughout the project we worked closely with the client to ensure they were fully involved with the creative development of the website, and that it achieved both branding and commercial objectives. Since launch, the average time spent by visitors on the new website has doubled and the enquiries for weddings have increased by over 200%. “Choosing a marketing communication company is a big decision and one I took a long time to appoint, after numerous discussions with various local and national agencies I decided that Ultimate was my preferred choice. “They had a big edge initially on the innovative and user-friendly ideas they presented to us after the brief I provided, going that extra mile to encapsulate our thoughts and get them into a well presented pitch. “Through the design process we had an account manager that was particularly punctual in keeping to time constraints we gave them. Regular meetings meant that we were all singing from the same hymn sheet throughout. “The final product was delivered on time, to a very high specification and is currently providing the results I wanted, consequently we are seeing great growth in numbers to the website, usability, conversion rates and feedback from our clients. 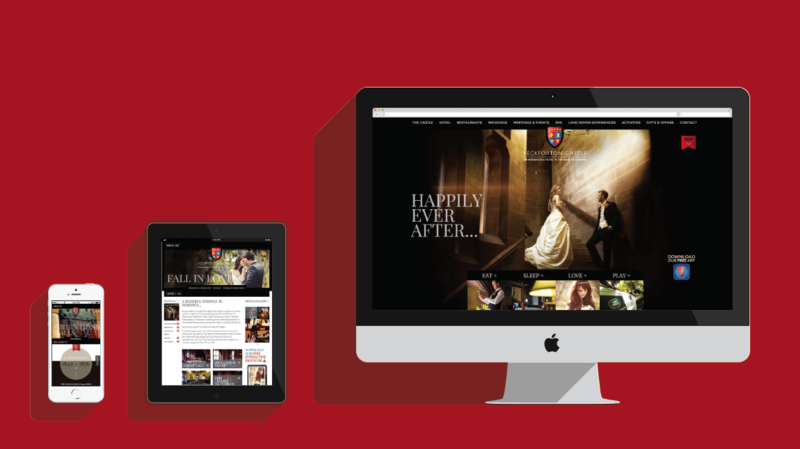 “We were very proud of the website we created for Peckforton Castle. It is such a stunning venue that it was a great opportunity to show our creative flair. The client immediately loved our Eat, Love, Sleep, Play concept and finished product is producing the results the client wanted at the start of the process”.